Did you know that plastic is the largest source of ocean litter? UK telecommunications provider Sky knows the danger of pollution in the oceans, and in January 2017 created the Sky Ocean Rescue campaign. The aim of the campaign is to shine a spotlight on issues affecting ocean health and work to create solutions. 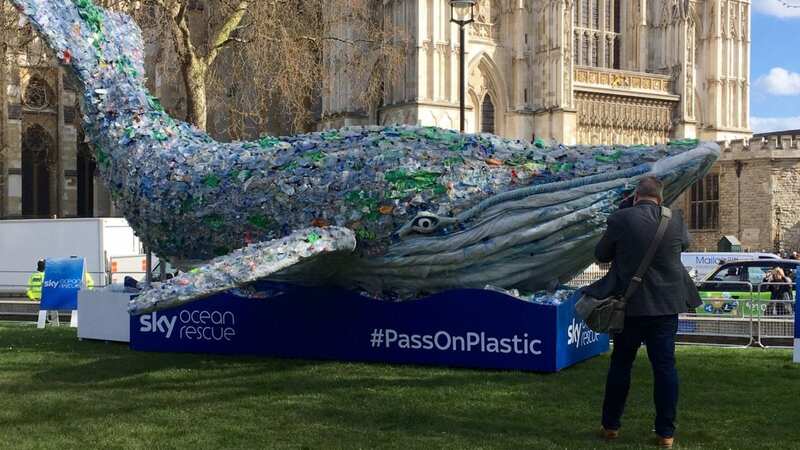 It also introduced the UK to Plasticus the whale, who is made up of a quarter of a ton of plastic, the same amount that enters our oceans every second. Sky has created additional events to continue educating the public on reducing plastic use, while eliminating single-use plastic internally. As part of the ongoing program, Elevate provided brand ambassadors to help spread the ocean rescue message to the public. The brand ambassadors were tasked with encouraging people to take a pledge against plastic through small lifestyle changes. These include saying no to plastic straws or using reusable bags at grocery stores. Brand ambassadors also provided passersby with reusable water bottles. To promote the campaign and messaging, attendees were encouraged share content on social media using the hashtag #PassonPlastic.